Enjoy lunch in the park. If you do not already have a place to stay in Salt Lake, we can book your hotel for you, as we get very good rates at the downtown Crystal Inn. We pick up at most Salt Lake City downtown and airport hotels, and will take you out to the Salt Lake City airport. 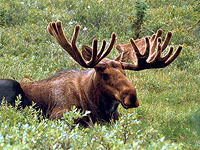 There you will hop onto your plane for the 80 minute flight up to West Yellowstone. You can either take a morning or afternoon flight up to Yellowstone. If it is the morning flight, you can go horseback riding over the Continental Divide that afternoon, for an additional $70 per person. You could also take an evening ride instead, and for an extra $20, enjoy a western cookout! There is no horseback riding on Sundays. 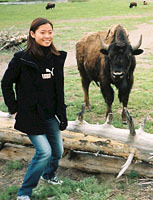 If you choose not to go horseback riding, or arrive later in the day, you are on your own to explore West Yellowstone. You can go hiking in the park, shopping, stroll around town, visit the Grizzly and Wolf Discovery Center, or check out the Yellowstone story in the IMAX theatre. You will spend the night at Al's Westward Ho. Dinner is included and is served at our little restaurant/Internet Cafe next door to Al's. Map Breakfast is provided. It's now time to get into the park! The roads running through Yellowstone make up a massive figure of eight (see the map to the left). 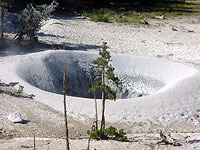 The lower loop of the figure of eight comprises most of the thermal features that are to be seen in Yellowstone, including, of course, Old Faithful! Map After Madison Junction the tour turns down Firehole Canyon Drive, a side road that follows the Firehole River. The Firehole River runs through the thermal areas of Yellowstone northward, to join the Gibbon River and form the Madison River. 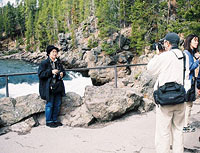 The Firehole is world famous amongst anglers for its pristine beauty and selection of brown, brook and rainbow trout. The road takes guests past 800 foot thick lava flows. Firehole Falls is a 40 foot waterfall. There is an unstaffed swimming hole here. The next stop is the Midway Geyser Basin, home to two of the largest hot springs to be found anywhere in the world, as well as Excelsior Geyser, now dormant, but discharging thousands of gallons of water every minute. Yellowstone Lake is off to the east as we make the trip up to Fishing Bridge. From there we head through the Hayden Valley, following the Yellowstone River, up to Grand Canyon of the Yellowstone. Map The Hayden Valley is known for its wildlife, particularly large herds of bison at certain times of the year. It is also an excellent location to look for grizzly bears, especially in the spring and early summer when they may be preying on newborn bison and elk cubs. 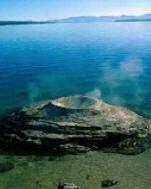 There will also be the opportunity to view the Mud Volcano and Sulphur Caldron areas. Map The Grand Canyon of the Yellowstone is an unexpected treat amongst the thermal wonders. The Yellowstone River has carved an impressive canyon through the rocks, over which two falls drop. The Lower Falls is over twice the size of Niagara Falls! It is in this area that you can catch a glimpse of the yellowish tinge to the rocks, from which the Yellowstone River got its name, but at a different location. We'll check out the canyon and falls from a number of different locations. You get so close to the Upper Falls that you almost feel like you can reach out and touch the thundering water. Don't! Map Most of our tours of the Lower Yellowstone Loop do not take in the Norris Geyser Basin. Norris is generally done on our Upper Yellowstone Loop tour. If, however, we have a group of people who will not have the opportunity to see it, and if there is still time after a fairly long day, we will try and squeeze it in. Map Although not as well known as the other geyser basins, Norris is the most thermally active part of Yellowstone. It is divided into two separate areas: Porcelain Basin and Back Basin. You will have the opportunity to stroll around both, enjoying the pristine beauty. Back Basin is home to Steamboat Geyser, the highest geyser in the world. It is now time to go back to West Yellowstone and the local airport. You will fly back to the Salt Lake City airport, where we will meet you and take you back to your downtown or airport hotel. Thanks for joining us. 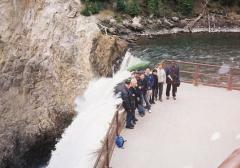 This tour is offered every day from the 1st June until the 30th September. Entry fee to Yellowstone is included. One night's lodging is included. Pictures of the motel we use can be seen here. Luxury lodging is available at a surcharge. We are in no way responsible if the air carrier delays your arrival into or departure from West Yellowstone. Our liability will only extend as far as refunding to you any portion of the tour that you miss. Prices are based on double occupancy. A single surcharge of $42 is applicable, or we can try and match singles. Please contact us for a lower rate if there are three or four to a room. On some days it may be necessary to take the free hotel shuttle between your Salt Lake hotel and the Salt Lake airport. Payment Details: While we would rather you not make a booking until you are sure you want to go, you are welcome to cancel the booking any time up until 31 days prior to the start of the tour, and you will get a full refund. After that time, we will not accept a cancellation and you will have to pay for the tour in full. Trip insurance is available. Half the cost of the tour will be charged to your card any time from 31 days prior to the start of the tour, and the balance will be charged any time from 7 days prior to the start of the tour.